Project images that get noticed by your audience, wherever they are. Install the projector in the ceiling and blow up images to 300 inches and share your message to hundreds of people in a large auditorium. Take your information with you. Use a memory drive or a commercially available USB cable and plug in the Ricoh PJ WX5361N directly to any desktop computer or laptop via a wired or optional wireless LAN. Take advantage of the intuitive on-screen prompts and one-touch controls to tailor the Ricoh PJ WX5361N to your preferences - and to the environment. Images are balanced and adjusted for you automatically. 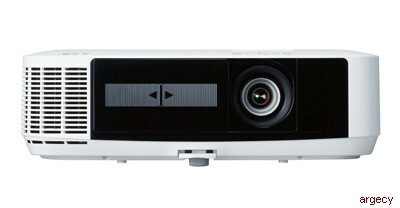 Deliver clarity with 4000:1 contrast ratio, 3LCD technology, 5,000 lumens and 1200 x 800 dpi image resolution to highlight the finest details with incredible brightness and clarity every time. Showcase your data conveniently with the Ricoh PJ WX5361N. You can use Advanced Network Utility to set up a password so attendees can access projected images directly from their computer for later use. Allow the projector to balance images and reduce distortion for you, or you can use the 4-point correction function to correct keystone (trapezoidal) distortion yourself. Project images from one computer to multiple projectors, so your team can conduct multiple meetings in multiple locations. Set an administrator to configure settings for multiple systems remotely using PJLink Management software. Use multiple sources, including DVDs and audio files, for your presentation. You'll have plenty of HDMI connection ports to add new media sources and enhance your presentation with digital and high-definition images and movies easily. Change the way you share information with Ricoh PJ WX5361N - every time, everywhere. You can even use the projection system to display medical images, including x-rays saved in the DICOM format, for non-diagnostic presentations. Save time and conserve energy with energy-efficient and easy-to-use Ricoh PJ WX5361N. Plus, you can take advantage of two Eco Modes that adjust lamp brightness automatically to accommodate darker or brighter images to help reduce energy costs. Access to plenty of HDMI connection ports to add new media sources and enhance your presentation with digital and high-definition images and movies easily.